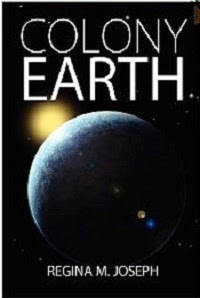 Click here to buy Colony Earth or to read additional reviews! When extinction is possible, tribes will come together. Brief synopsis: Lil is a captain and future destined leader of Alterran, who is stationed on Hawan, what was supposed to be a temporary Earth shelter. Lil came to Earth with a group of explorers and has been stranded, since their portal was incapacitated. Now, their food supply is approaching dangerously low levels and a massive comet is heading toward them. While out on a trial hunting trip, Lil and his crew stumble upon Alana and Maya, two women of the Earth. Lil opens an entire universe of problems, when he agrees to help them, going against the non-disturbance law. Originality: What I love about this book is that the Earth Lil is living on is 10 to 11,000 years ago, based on the mastodons and cave people hunting them. Some of these cave people are special, born from Atlantis, like Alana. I love the opposites interaction of the cave people, who dress in furs and hides with the conflict of the Alterrans, who can change their garment to be whatever they want it to be and even make it a protective shield. Characters: I very much enjoyed the characters Alana and Maya and their friendship that carried me through the story. Through heart-wrenching tough times, they never give up. I found that I actually enjoyed the scenes where I was involved with Alana's side of things the most in the story and I felt most for her when things went wrong. A thought the relationship between Lil and Alana was well developed and clever and especially enjoyed the nervous courting. I did like Lil and his uncertainty, as he balanced what he thought was right and what was right-according to his people. It was cool to follow him through Hawan so I could see the structure of the compound, the imaginary waterfall and cool holograms. That said, I think the nature environment surrounding Alana drew me in more to her side of the story than the rigid compound of Hawan. I have to confess I am not a hard science fiction reader, so I do get a little lost when descriptions get lengthy to explain and somehow convince the the reader of the possibility that things can actually happen. The one problem I did have with the book were too many secondary characters. With science fiction-fantasy like this, the names are already unusual and difficult to keep track of at first when you are getting to know them. There were so many introduced in the first chapter, I got lost for a bit, but definitely found my way into an amazing story. The author's descriptive and colorful visuals drew me into each and every scene. Recommendation: Colony Earth goes well with a power bar-if you read, you'll understand why, oh and mead! This book is well polished and I highly recommend it for sci-fantasy and medium to hard science fiction readers.